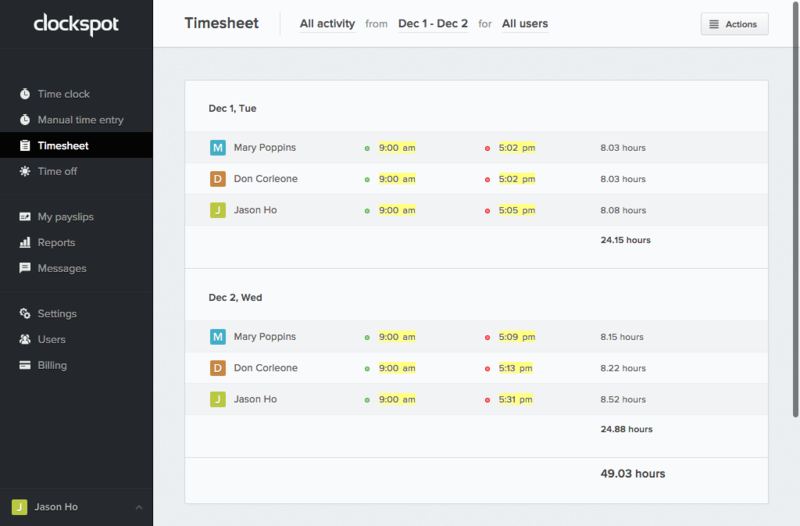 Here you see that on Dec 1st, 8.03 + 8.03 + 8.08 hours were worked, totaling 24.14 hours, but the timesheet shows 24.15 hours. Similarly for Dec 2nd, 8.15 + 8.22 + 8.52 hours were worked, totaling 24.89 hours, but the timesheet shows 24.88 hours. But don’t worry, the totals are not wrong! 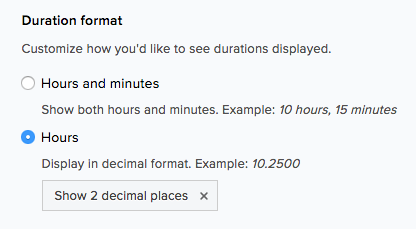 So when we display 4 hours and 1 minute, we’ll show 4.02 hours if you’ve opted to show durations to two decimal places, or 4.0167 if you’re showing durations to four decimal places (the default setting). If you have lots of clock times that are being cut off at 2 decimal places, you’ll quickly see that you can’t manually add up the intermediate steps to get the final total. Note that Clockspot does not perform any rounding whatsoever on clock times! We simply display the final, accurate total to the number of decimal places you’ve configured in your settings. You can change your duration precision by going to Settings > General Settings > Timesheet tab. Another common mistake people make is confusing 8.15 hours for 8 hours 15 minutes, or 8.30 hours for 8 hours 30 minutes (don’t worry, this trips us up sometimes too!). Just remember that when you see 8.30 hours, it means 8 hours and 18 minutes (0.3 hours = 0.3 x 60 minutes = 18 minutes), not 8 hours and 30 minutes! Clockspot doesn’t show the correct time. How do I fix this? Why don’t I see any icons or images when I log in? I added a clock location, but I still can’t clock in! My employees don’t have email. Can I log in with a username?